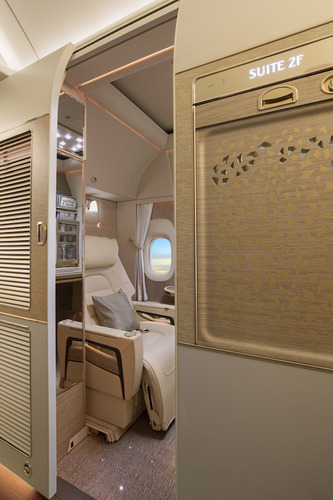 Emirates has displayed entirely new interiors for its Boeing 777 fleet, including luxury Private Suites for First Class passengers. With sleek design features inspired by the Mercedes S-Class, the private cabins feature sliding doors for privacy, integrated storage areas and up to 40 square feet of space. These private suites are situated in a 1-1-1 configuration where even suites situated in the middle of the plane will have a view thanks to virtual windows that display a real-time feed from external cameras. In addition, the soft-leather seat reclines into a fully flat bed with a so-called “zero-gravity” mode inspired by NASA that gives a feeling of relaxation and weightlessness. 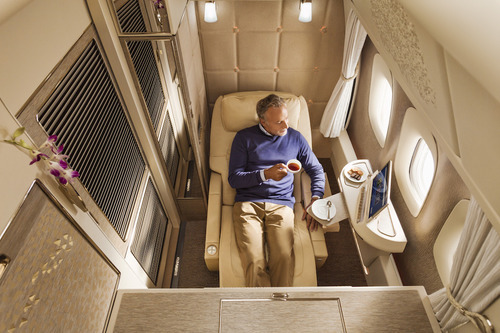 Other high-end amenities include a minibar, an inflight entertainment system and a wireless mode to adjust the seating. The airline also announced upgrades to business and economy class with advanced in-flight entertainment and redesigned seats, again inspired by Mercedes.